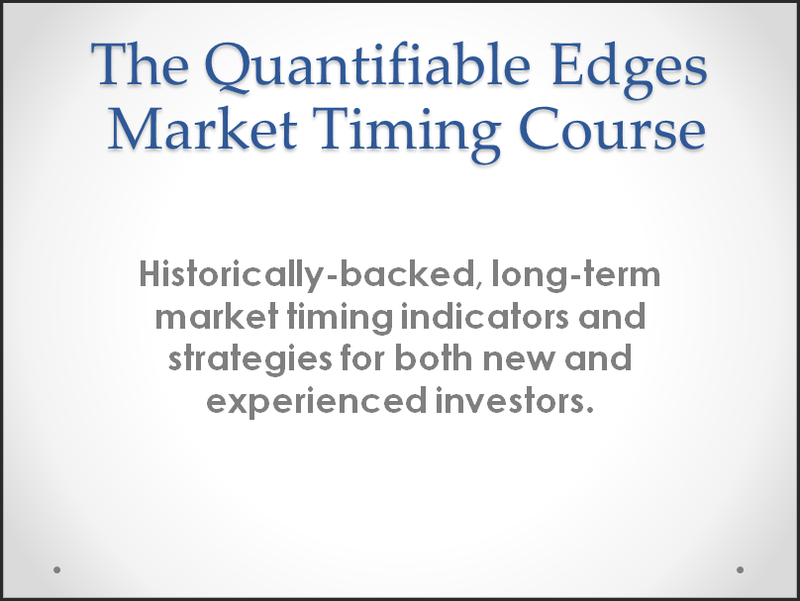 When it comes to predicting market movement, there are an endless number of indicators out there. And they are based on an ever-growing number of ideas. The most common indicators are based on things like price action, volume, breadth, sentiment, government policy, or cross market analysis. But people might also look at sun spots, moon cycles, weather, or any number of things where they find a correlation to market movements. No matter what indicators a trader favors, it does not take long to realize that none of them work perfectly. And even if you find one that is incredibly reliable, it may not be providing strong readings often enough to generate consistent returns. Therefore, every trader I know looks at more than one input or indicator to try and find an edge. Of course the more indicators you use the more likely it is that some of them disagree. It is rare that a trader will see all of their indicators line up perfectly at the same time. Often price action may be suggesting one thing, while breadth, or sentiment, or intermarket action may be suggesting something else. So traders need to determine whether the mix of evidence is suggesting a bullish or bearish indication, and how strong that indication is. At Quantifiable Edges, I use indicators in a slightly different way. Rather than simply interpret readings or patterns that I am seeing, I generate market research studies to understand how similar situations have performed historically. 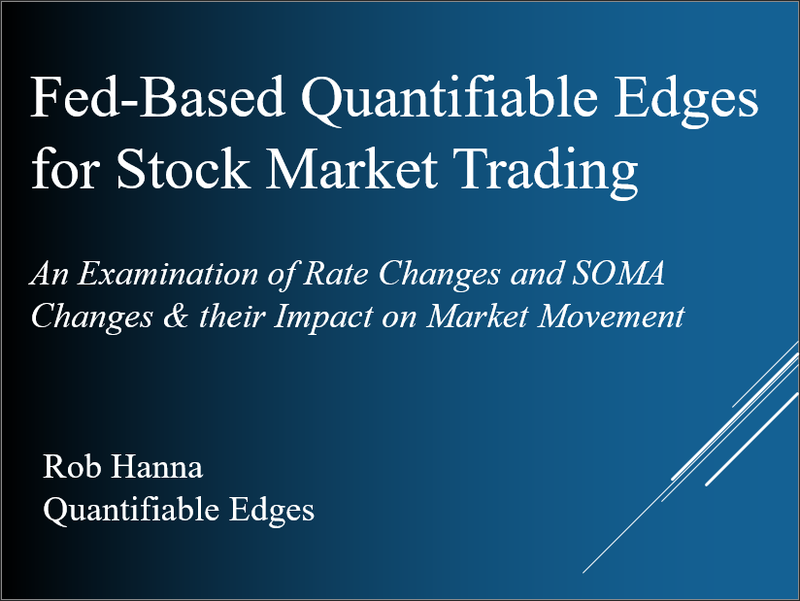 It is these studies that I publish in the Quantifiable Edges Subscriber Letter (and sometimes the blog or elsewhere) that help me to establish my market bias. But like other traders indicators, my studies don’t always agree. So the tool I use to help me weight my studies and determine a market bias is the Aggregator. A chart with the Aggregator included can be seen below. It shows readings from December 2017 into January 2018. Each day, the Aggregator takes the current studies on the Quantifiable Edges Active List and creates a composite estimate. That estimate looks out over the next few days, and is represented by the green line. If it is above zero, then estimates are looking for the market to rise over the next few days. When the green line is below zero, then estimates are anticipating a decline. The black line I refer to as the Differential. It shows the difference between recent estimates and actual market movement, and it provides an overbought/oversold indication. When it is above zero, that implies the market has failed to meet recent expectations and could be considered oversold. When it is below zero, that means the market has exceeded recent expectations and could be considered overbought. Combining expectations with overbought/oversold means there are 4 possible formations on the chart. The Aggregator expectation line is above zero and the Differential line is below zero. 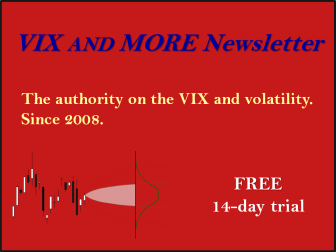 The Aggregator expectation line is below zero and the Differential line is above zero. Formation 1 I generally consider to be a bullish setup. Oversold with bullish expectations is often a good place to buy. Formation 2 I generally consider bearish. Overbought with bearish expectations can mean a good shorting opportunity. Formations 3 and 4 I generally consider to be neutral. Positive expectations in an overbought market often don’t offer great risk/reward. And neither do negative expectations and an oversold market. So I will not normally be looking to take on new index positions when the Aggregator is in formation 3 or 4. But both of these still provide valuable information. Oversold with negative expectations keeps me from trying to go long a pullback that does not show a high probability of bouncing. And knowing there are positive expectations when the market is overbought helps me to avoid shorting into overbought situations where the historical indications are for further gains. To help you easily spot where the Aggregator formation has changed to bullish, bearish, or neutral, I have included arrows and signals on the chart. 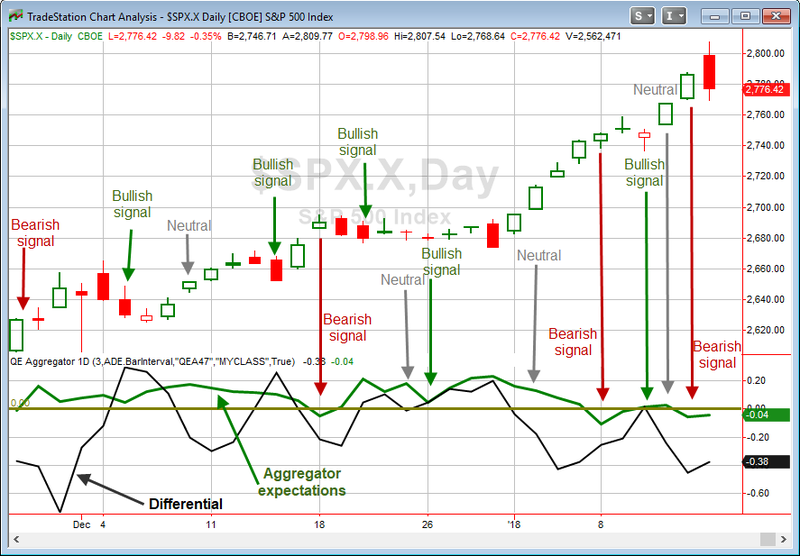 Keep in mind, the signals occur at the end of the day and suggest a bias for the next few days. As you can see, the Aggregator has done a nice job of anticipating short-term market movements. The bottom line is the studies help me determine whether there is an upside or downside edge. The Differential measurement helps to assess risk/reward. The Aggregator chart combines them and helps me to establish a short-term market bias. The Aggregator chart is published each night in the Quantifiable Edges Subscriber Letter, and it has proven invaluable to me since I began using it in 2008.